Meet us at Sólheimajökull on the South Coast of Iceland for a Glacier Walk tour filled with exploration and adventure. Learn about the features of the glacier from your expert guide and capture memories that will last a lifetime. On this fun, safe, and easy to moderate glacier hiking tour, you get to explore the wonderland of ice sculptures, water cauldrons, ridges, and deep crevasses on the breathtaking Sólheimajökull glacier. While enjoying all the features of the glacier and its spectacular surroundings, you will learn more about the behavior of glaciers and their impact on nature. No technical skills are required for the tour. 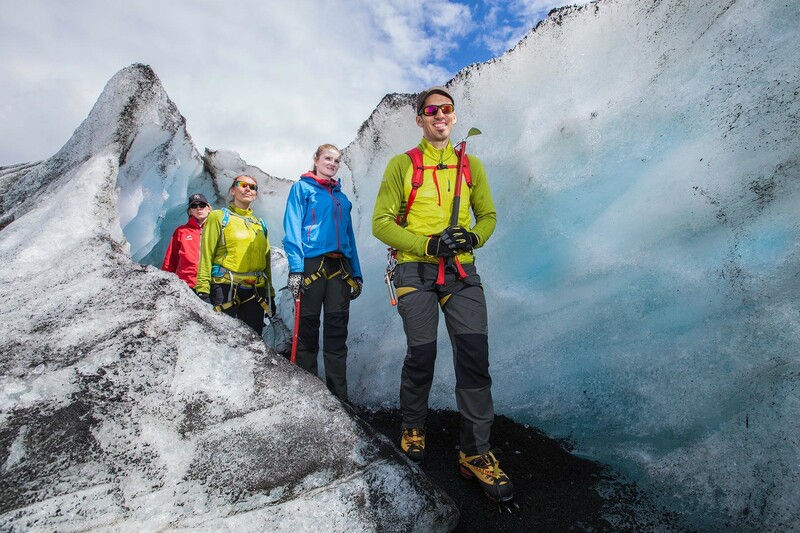 Your experienced glacier guide will teach you how to use basic glacier equipment that we provide for all Glacier Walk tours, such as crampons and an ice axe. The unique experience of a Glacier Hike on one of the many retreating glaciers of the world is sure to leave lasting memories. The Sólheimajökull glacier outlet extends from the great Mýrdalsjökull glacier, down to the sandy plains of the Icelandic south coast. The spectacular surroundings are marked by rugged and majestic rock formations thoroughly shaped by the glacier. We took the 2-hour Glacier Walk with Icelandic Mountain Guides at Sólheimajokull. We were in a group of about 10 people with one guide. The walk was spectacular --- ice and scenery. Lots of great photo ops.